“We went to the market on the evening of December 12 to prepare for the next day’s lunch,” said Ma Pan Ei Mon, the wife of jailed Reuters journalist Ko Wa Lone. The memory of their time together a year ago is one that Pan Ei Mon cherishes. The Indian central government will initially spend Rs 700 billion (70,000 crore) to spread gas pipelines across the country. Myanmar and Denmark have concluded their annual bilateral government-to-government talks on development cooperation in Nay Pyi Taw. Denmark used the opportunity to confirm the commitment of DKK 505 million (about 80 million USD) for continuing cooperation in the three focal areas of peace, rule of law and human rights; fisheries, climate change and SME support; and basic education. More European businesses say they have lost confidence in Myanmar due to concerns about the National League for Democracy-led government’s management of the economy compared to the last two years, a new survey shows. Twitter CEO Jack Dorsey has admitted he needs to learn more about Myanmar after coming under fire for his recent comments about the country. 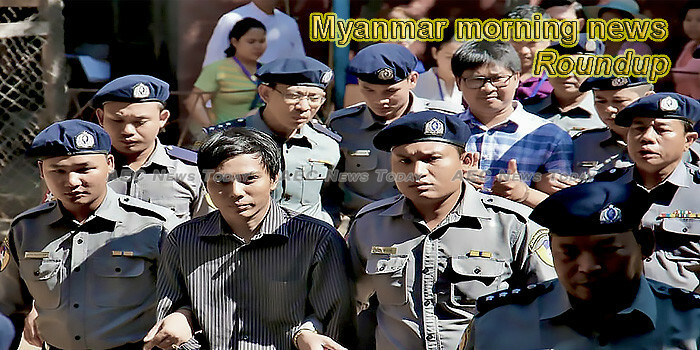 Jay Jay the Journalist was written in prison by Wa Lone, one of two Reuters reporters arrested in Myanmar a year ago. he commission formed by the Myanmar government with the purpose of investigating allegations of human rights violations against the Rohingya community in Rakhine State said that they welcome victims of the alleged abuses to submit their evidence to them. Myanmar and India inked science and tech deals during President Mr Shri Ram Nath Kovind’s state visit on Tuesday as Delhi also pledged to train judges and build houses in crisis-hit Rakhine State. Members of Myanmar’s independent panel investigating the alleged human rights abuses in northern Rakhine began a four-day closed-door meeting yesterday to evaluate information that the panel has gathered despite questions from international human rights organisations about its independence. Amnesty International Australia has called on Australia’s foreign affairs minister to act on the Rohingya crisis, as she visits Myanmar this week. A year since the arrest of Reuters reporters Wa Lone and Kyaw Soe Oo, media battle official distrust, repressive laws. The Restoration Council of Shan State (RCSS) shot dead at least four ethnic Pa-O in southern Shan State on Tuesday in what the armed group said was self-defense. The Burma Human Rights Network (BHRN) welcomed on Wednesday the European Council’s recent decision to adopt additional sanctions against Myanmar’s senior military and border guard officials for alleged human rights violations. U.S. Secretary of State Mike Pompeo called out Myanmar for severe violations of religious freedoms over its treatment of religious and ethnic communities in a statement on Tuesday. Students from Technology University (Yadanabon Cyber City) met Mandalay Region government on December 11, 2018, at the regional government office to discuss the murder of a student from the university. Min Ko Naing from 88-Generation Peace and Open Society said that the peace process needed to be monitored continuously to find out who was stubborn and in which points. Myanmar’s Northern Alliance Ethnic Forces, comprising three ethnic groups, on Wednesday voiced support for the government’s efforts for national reconciliation and nationwide peace, according to a joint statement of the forces. About 6,000 residents of Myitkyina, capital of northern Myanmar’s Kachin state, staged a protest on Tuesday over the jailing of three prominent youth activists who helped organize peaceful demonstrations earlier this year, demanding their immediate release, those who took part in the event said. Freedom of expression activists and civil society organizations on Wednesday called for the unconditional release of two local Reuters journalists who were arrested by the government one year ago Wednesday. The Arts and Humanities Research Council (AHRC) is seeking applications for its Parliaments and People programme with an aims to create opportunities for scholars and artists in Myanmar and Ethiopia to undertake research that helps scrutinise, understand, communicate and support the processes and relationships required to deepen democracy in those countries. Myanmar is taking steps to implement its child labour eradication program as part of efforts to secure a better future for the children in the country, which has 1.1 million children below 18 years of age engaged in labour and more than 600,000 children working in vulnerable situations. Myanmar authorities have seized 292,500 stimulant tablets worth of 585 million kyats (377,419 U.S. dollars) in Rakhine state, according to the Central Committee for Drug Abuse Control (CCDAC) on Wednesday. Authorities are looking into amending Mandalay’s City Development Law to make it more responsive to the needs of the people. Myanmar will start collecting and providing credit data after a new credit bureau opens in the next 9-12 months, after which banks will be in a better position to offer loans to a larger volume of businesses, said U Zaw Lin Aung, chair of Myanmar Credit Bureau Ltd.
Over 1000 applications have been received for mining blocks since July, according to U Min Min Oo, permanent secretary at the Ministry of Natural Resources and Environmental Conservation … However, only 193 of all the applications received are complete, he said. President Ram Nath Kovind on Wednesday launched a mobile app for farmers in Myanmar and dedicated a centre to promote agricultural research and education to the people here. Telenor Myanmar worked with Ericsson to conduct NB-IoT trials on its LTE network in the city of Mandalay, claiming to be the first in the country to test IoT networks. Universities of Myanmar and Thailand have vowed to cooperate in education sector following a Thai delegation’s recent visit to a Myanmar university in Myeik, Myanmar’s southern Taninthayi region, the official Global New Light of Myanmar reported Sunday. The Financial Education for Sustainable Growth Study conducted in August 2017 surveyed 1,044, people across Yangon, Mandalay, Taunggyi, Pathein and Magway. The study exposes a need for financial education among Myanmar people. Out of over 800 islands in the Myeik archipelago, there are only three islands left for pearl farming, according to U Myint Thu, General Manager of Myanmar Pearl Enterprise under the Ministry of Resource and Environmental Conservation. MacArthur’s Blended Scotch Whisky will be the first in a new range of products to be introduced into the Myanmar market for its consumers. The awarding ceremony of the second Myanmar Responsible Tourism Awards was held at Chatrium Hotel in Yangon on Tuesday evening. India citizens can now apply for visas on arrival (VOA) at the country’s three international airports in Yangon, Mandalay and Nay Pyi Taw starting from this month, the Ministry of Labour, Immigration and Population said. The owner of a hotel on Myanmar’s Inle Lake has dropped the Best Western brand reverting to the hotel’s original identity ‘Thousand Island Hotel’. White sandy beaches, sunsets that take your breath away, and emerald-green waters surrounding an endless stream of lonely islands are only a part of what makes the Myeik Archipelago a special place. The title of the Burmese Days photo exhibition is evocative of George Orwell, but the event had little to do with the renowned British novelist. Among the Myanmar writers who have grasped the elegance of the written words is essayist Maung Yint Mar (Kyaung Kone). He is the latest winner of the National Literary Award for Essays announced late last month. Myanmar beat Singapore 2-1 while Thailand won over Malaysia 3-1 in men’s football tournament of the ASEAN University Games in Nay Pyi Taw, Myanmar on December 10. This week’s Myanmar morning news feature photo acknowledges Human Rights Day December 10.